UPDATE: State Senator and Congressional Candidate Dina Titus has been added to the panel. 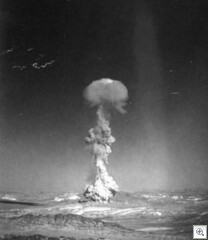 We look back at the years of nuclear testing at the Nevada Test Site with nuclear scientists and workers as well as those who watched the early morning blasts from Las Vegas. An engrossing evening of history and memories from two men who worked at the Nevada Test Site, scientists Al O’Donnell and Roger Staley. Sen. Richard Bryan was a young teenager growing up in Las Vegas during the above ground testing years and he will talk about waking up in the early morning hours to experience the detonations. Nate Schwartz owned a bar “Prospector’s Headquarters” that was a supply store for uranium miners. So come and learn about the history of above-ground testing and living in the shadow of the bomb. Classic Las Vegas Blog also has the stories about the death of two very important players in Las Vegas’s recent history. Robert Maheu , “Howard Hughes right hand man” and Fredric Apcar, one of the legendary showroom producers at the Dunes Hotel. If there’s any other blog about Las Vegas (besides VVV, of course) that’s a must read, it’s Classic Las Vegas.